The Timeliness of Repair | continent. Repair work is a deeply timely affair. The language that we use to describe repair action evokes important senses of rhythm, duration and precedence. For example, the value of the bodge, or kludge is in producing an improvisational fix that will hold within the immediacy of the situation. On the other hand, restoration implies work of a longer lasting duration; it also communicates a sense of precedence, as orienting towards a prior form or state. The language of repair reveals taken for granted temporal ontologies, which ground repair and make sense of breakdown. My Mother often repeated the 18th century English aphorism "a stitch in time saves nine" as she mended and patched three boisterous daughters before we unravelled entirely. Here, repair is understood as an expedient intervention into a world that decays inevitably along a linear trajectory. This short paper explores the temporal dynamics of a particular category of repair work, namely the livelihood maintenance and mending of mobile phones in Kampala, Uganda. As Denis and Pontille describe in this issue, a common configuration of repair labour involves professional technicians being employed to maintain systems or objects in order to keep them working and unproblematic for their users. In this mode of ordering, objects are enacted as ontologically stable most of the time, with breakdown appearing to be an exceptional event. Where the ontological stability of objects or systems is foregrounded, repairers' work tends to recede. If breakdown is exceptional, then so are they - their labours need to be marginalised to sustain the (illusion of) the basic stability of objects or systems. I draw on this productive generalisation to sketch some dominant temporal figurations of repair. The term “repair” comes from the Old French word “reparer”, and the Latin word “reparare”. The prefix “re” means “back” and the root “parare” to “make ready”. In repair we are bringing objects back to readiness. Repair restores degrees of past capacity for present and future use. This reflexive temporal tension is written into the heart of the term. However, in situations where objects are taken as ontologically stable and breakdown is exceptional, repair emphasises returning objects to a prior functionality. Repair as “return” means moving back along a linear conception of time. But to think about repair (and the world) in this way is to obscure the complex forms of change - and their temporal unfolding - that both lead to breakdown and are enacted through repair work. In contrast, in this paper I explore a notion of repair built around differentiation. In doing so, I build on two bodies of literature that have profoundly challenged the role and status of material objects in the social world. Actor network theory and its aftermath has emphasised emergent networks of associations and hybrid relations between actors and agencies achieving only partial and temporary stabilities as objects. Material culture studies and feminist new materialism(s) have underscored the processual character of materials, which in their state of flux always exceed stable object positions or signifiers. Understanding repair as differentiation foregrounds the temporal dimension of this processual unfolding of socio-material change. It attunes us to the specific forms of change that occur at particular times and places – to particular things – rather than foregrounding the reproduction of social and material order. Repair as differentiation makes temporal horizons of breakdown and repair visible, adding depth and nuance by showing the huge range of processes involved in decay, fracture and failure that might otherwise be dissolved in the category (or state) of breakdown. These are consequential in how we organize to sustain our world, particularly in an age where ecological limits are unmistakeable. Differentiation also reveals the creative, inventive and innovative work that happens in the process of fixing, across human and non-human bodies. Repair sites can recover the ways that technologies are sustained (or not) in particular places through different cultures and economies of repair that incorporate their own senses of timeliness. Differentiation generates remainders, fragments and trajectories that may not be contained in the neatened stories of return. 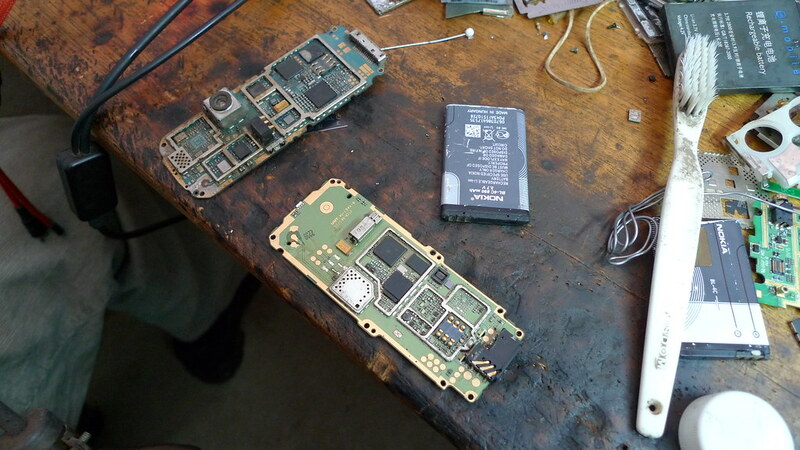 My examples come from ethnographic fieldwork in the mobile phone repair workshops of Kampala, the capital city of Uganda. Over the last fifteen years the infrastructure of mobile telephony in this region has expanded exponentially, from a few hundred thousand subscriptions to many millions. Small independent businesses have emerged to get mobile handsets enrolled on Ugandan networks and keep them working. I use three ethnographic vignettes of repair to sketch three different registers of breakdown that occur in mobile phones. I move from slow changing degradation to forms of circulation, and review how these are repaired - highlighting differentiation rather than return. I then gesture towards what cannot be fixed - the remainders of repair, and the very different temporal horizons evoked by waste. Two phones wait on the workbench for Jason’s attention. Dust, particulate matter and water from Kampala’s stifling atmosphere deposit a layer of sediment on top of the motherboard, collecting around integrated chips and encrusting connective surfaces. This accumulation has precipitated breakdown, as oxidation makes battery terminals charge intermittently, and collections of grime inhibit the workings of small resistors. In response, Jason takes the white toothbrush and dips it in a small bottle of benzene. He brushes the bristles deftly across the surface of the motherboard, freeing particulates from nooks and surfaces. Cleaning circuit boards is much like cleaning teeth: as it washes across the motherboard, the solvent dissolves grime, and the action of the bristles removes residues, revealing a fresh and newly connective layer of metal. The repair of tarnished and dirty phones in this example highlights breakdown as process, pointing to continual and incremental forms of change at the molecular level. Accumulation and oxidation are gradual reactions, where dust and pollution particles adhere to the motherboard, and metals lose electrons to the air. This is the slow temporal horizon of breakdown-through-being, the emergent dance of object and environment. In the case of the mobile phone, the incremental changes of oxidation and the build-up of grime are obscured visually by the mobile handset, which has been designed to differentiate surface and interior workings. These slow changes take on a different temporal rhythm, catalysing as event, when tarnished surfaces stop the phone from working - and practices of communication are interrupted. A story of repair as return would foreground the ontological holism of the object restored. But repair as differentiation gestures towards the micro-temporalities of always-changing lively matter, as it tips over into the indeterminate register of breakdown. The conductive materials are renewed, but only by removing a layer of material through human and chemical action. This leaves in turn its own legacy in the form of toxic residues in the skin and body of the technician. After lingering too long on the workbench, phones that cannot be repaired must be returned to their rightful owners. Technicians often buy these “dead sets” from customers for a little money. They cannibalize these devices – stripping and reusing removable parts such as screen capacitors, resistors and integrated chips. In the hands of technicians these phones lose their ontological coherence, becoming collections of parts. At the workbench, Jason uses a jet of hot air from the blower to free capacitors and resistors from the motherboard of a “dead” phone. Picking them up deftly with tweezers, he transfers them to a broken phone of the same make and model, re-seating them carefully onto the motherboard, where they will take the place of malfunctioning components. Re-used parts are popular because they are cheaper than buying new, and some spares are not available by other means. This is most often the case for “Chinese” devices (a categorization used by technicians to distinguish phones made in Asia from “original” phones from well-known multinational brands). A sub-set of these are “clone” phones: beneath housings of “Nokla” or “Snoy Ericsson” [sic] devices, screens and parts are rarely standardized. If technicians manage to locate a 37-pin screen for a “Chinese” phone, there is no guarantee that these will be in the correct configuration. Buying spares for these devices requires travelling around downtown on foot, testing screens by soldering them on, to be removed again if the part fails to match. When the motherboards have been stripped of all useful parts for use or sale, they are bought for recycling by Chinese traders who regularly make rounds of the downtown workshops. On Jason’s workbench a phone gets repaired, but more has happened here than just a return to functionality. Repair involves processes of grafting and hybridity, as the phone carries parts from another device of its “kin”. Although technicians call on familiar metaphors of “death” to describe phones broken beyond repair, this is not the traditional timeline of precedence that human lives or product lifetimes might suggest. Moving “beyond repair” (for reasons of expertise, tools, parts, or economic logics) phones become something else, beyond “death” – as parts become re-mobilized and re-configured into new devices. The process has its own exteriorities, as the motherboards travel to China for recycling and into unknowable futures. In tracing electronic waste through recycling and into the production of other goods, Lepawsky and Mather argue that instead of linear life cycles, we need “to think in terms of distributed and transitory ontologies that are effects of intermingled material affordances and practices”. This story offers one example – of livings, rather than lifetimes. Of phones unmade and remade not through return but through emergence, of wholes coming apart and being reworked into temporary stabilities to live across several forms and configurations. Inside the premises of London Eye International are two glass display cabinets filled with long rows of polished mobile phones. These are not the newest makes and models on the market. They are imports of “recycled” phones from a company based in central London, UK. The owner’s wife tells me how the phones’ (most recent) origin was preserved in the company name as a source of value and pride. 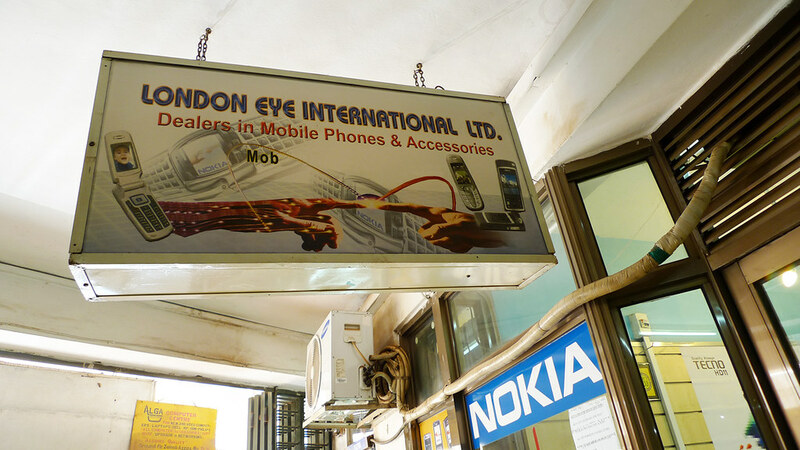 London is also my home - I found this shop by tracing a shipment of “recycled” mobile phones from a business in central London to Kampala. At the London head office of the recycling company used but working phones were traded in by post for a modest payment. At the receiving bay devices were unwrapped, tested and sorted. Most phones were shipped to Hong Kong (the global hub for the used phone trade) for resale at auction, and onward travel somewhere else, while devices valued at less than £15 were placed straight into a consignment for Africa. 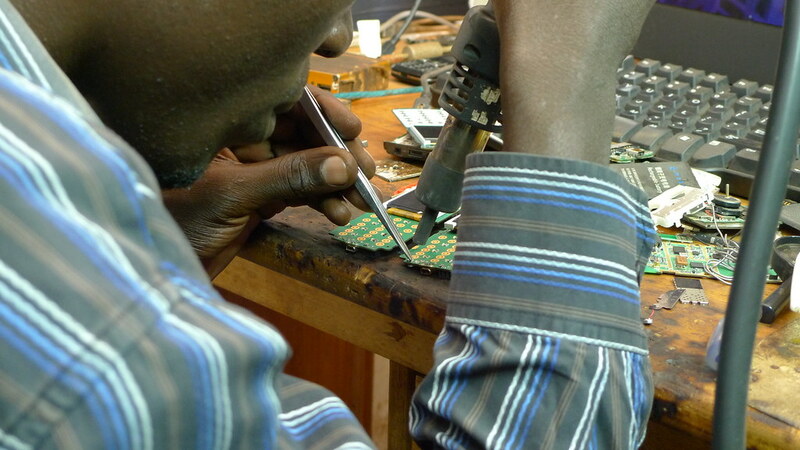 Following their arrival, work is often required to get these devices functioning in Kampala. At the repair workbench, technicians change language settings, replace batteries and worn-down housings. They use hardware interfaces, computers and software programs to access the embedded systems on board devices and remove the SIM locks that tether handsets to particular telecoms carriers or geographical networks. SIM locking is a particularly evocative example of the relationality of breakdown. Socio-economic logics inform the design of technological tethers, meaning that phones may “work” elsewhere, but are “broken” here. 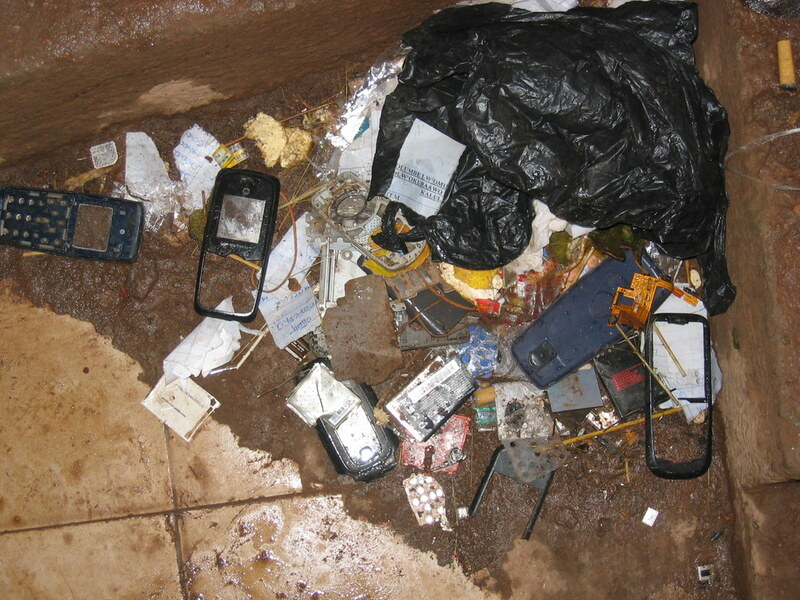 This example illustrates that it is not only material decay that must be managed in order to keep handsets functioning. We glimpse how phones of a particular generation fall out of use in relation to an ecology of obsolescence that is also tied to a particular place – the introduction of new features, capacities and design paradigms and alongside modes of consumption that subsidize the temporal logic of the upgrade. Repairing phones requires displacing them from London to Uganda, where the infrastructure of mobile telephony is in its infancy and still expanding. In this example repair cannot be conceptualised as a “return” to functionality. In order to get phones working, they have to become differently mobile: technicians remove the entanglements that devices have to particular geographies, and reorient them towards Kampalan infrastructures. Outside Jason’s workshop, discarded plastic housings are trampled into the Kampalan mud. Despite technicians’ materially engaged ways of working, some parts of the “dead” handsets remain unusable. Plastic housings form a large part of the discards from this shop, as they are not re-sellable and are cheaply available new. The surface housing of the phone is a site of extreme visibility, where wear and decay come to matter differently, as the socio-material dimensions of consumption mandate the fitting of new replacements. Batteries peek out of the rubbish pile too – once their electrochemical potency is spent they become useless to technicians. This rubbish is collected by the city, or a private collector, going into Kampala’s waste stream undifferentiated, as the capacity for recycling is not available. Neither plastics, nor the electrochemical soup of carbon and lithium salt in batteries are valuable enough to be transported to another place and regime of materials recovery. Rubbish is both reduced by burning and buried as landfill in the city. Plastic long outlasts its useful duration as a phone housing, a keypad or a battery container. The horizon for the decay of plastics runs to hundreds or thousand of years. These are forms of accumulation and endurance that extend far beyond the lifetimes of technicians, from which there will not be repair – as return or otherwise. The matter in the photograph will stay trodden into Kampalan earth across intergenerational timelines. Though wasted, these bodies are not inert matter but make new kinds of problematic entanglements, such as the plastiglomerates described by Lindstrom and Stahl (this issue). Over their long duration, plasticizers leach into soil and ground water, releasing endocrine-disrupting chemicals such as bisphenol-A that interfere with the hormone systems of humans and animals. Depending on their formulation, batteries may leach mercury, cadmium, lead, nickel, zinc and lithium that also accumulate in the body, with toxic effects. Amongst technicians at least, phones, parts and batteries are not understood in terms of their potentially deleterious effects on environments and bodies, yet leaching happens all the same. Repair has its own material legacies and externalities that cannot be tidied away. These accountabilities must also be grappled with, and they are more easily apprehended through a lens of differentiation rather than return. Yet intergenerational timelines also pose different challenges to the value and meaning of repair – in continuing the thread of what has gone before, rather than facilitating a more transformative shift (a question taken up by both Henke and Ribes in this volume). In the worlds I study phones can die in innumerable ways. They can die through material fracture, as phones fall from hands and pockets. They can die through slow oxidation as particulates build up in their interiors. They can die through the corruption of software code in general operation. These breakdowns, and the repairs that attempt to respond to them, surface different rhythms and durations of breakdown and repair action. Understanding repair as differentiation shows how materiality is always unstable and unsettled, changing at different speeds and intensities, and across varying registers. Thus attending to differentiation also opens a view onto socio-material processes of breakdown that are not predominantly material. Phones also die through the economies of software support that discontinue whole families of devices after just a few years’ service. Breakdown and repair are involved in remaking our understanding of precedence by de-naturalising linear life cycles. The forms of change illuminated in this article have different meanings - and different politics. The extreme disparity between the durations of useful consumer technologies and their material bodies poses urgent questions. How might repair enable us to live more carefully with the things and worlds around us? And how might we reimagine and redesign devices whose material parts and “social lives” can more closely align? For example the work of Annemarie Mol, in The Body Multiple: Ontology in Medical Practice. (Durham, N.C.: Duke University Press, 2002). For example the work of Jane Bennett in Vibrant Matter (Durham, N.C.: Duke University Press, 2010).